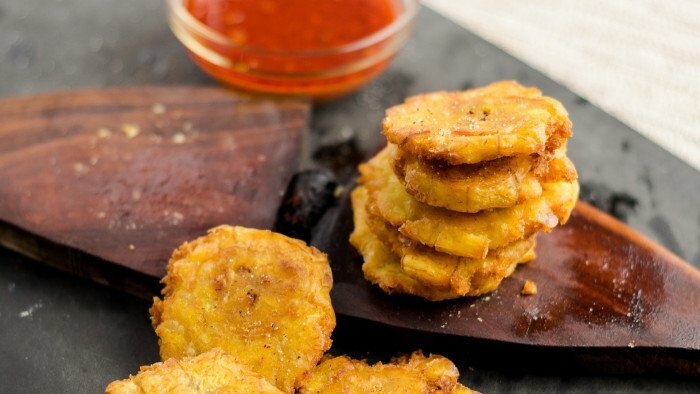 “Banan peze” (from the french “Banane pesée” which means “pressed banana”) is the Creole name for this fried plantains banana dish, they’re also commonly known as “tostones” or “pantacones” in many Latin american and Caribbean countries. In Haitian cuisine it is usually served as a side with the popular Haitian meal called “Griot” but ther’re also great as an appetizer or a snack. 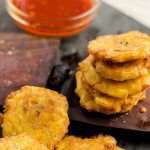 You will need either a tool made especially for squashing the plantain bananas or you can use a small flat plate, and squash it on your cutting board. When you are buying plantains, make sure you are buying the greenest ones, if they are yellow it will be too soft. Plantains are bigger than regular bananas and their skins are a lot thicker. Start by peeling the plantain banana. Score each one lengthwise, 2 or 3 times, if you peel it under running water the plantains tough skin seems to come off easier. In a large pan pour about 2" of frying oil. Heat oil on medium. 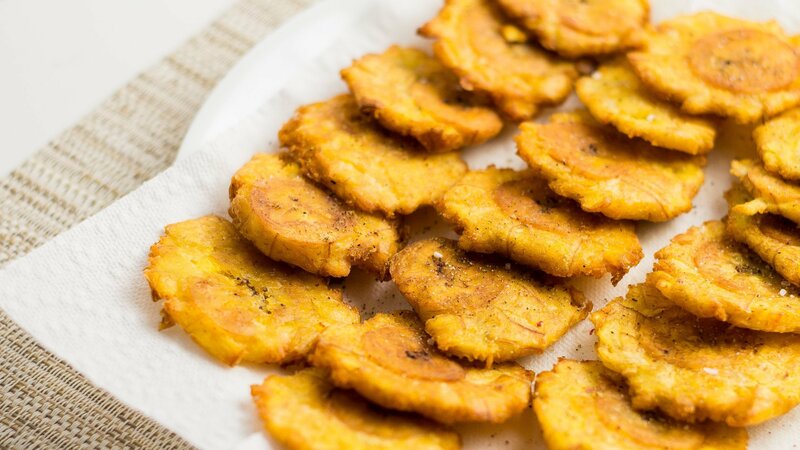 Place all the plantain banana pieces on a kitchen towel and make sure it is pat dry, then cut into 1" pieces. To test the oil, place a wooden chopstick or the end of a wooden spoon in the oil, if there are quick tiny bubbles around it then its ready. Carefully place the pieces of plantain in the oil for about 3 minutes on each side or until a bit golden, using a toothpick, pierce one of the plantain bananas, if the toothpick goes in without resistance that is when it is ready to be removed from the oil. Place the pieces on a cutting board, do not remove the oil since that will help in the squashing part so it doesn't stick to the plate. Put some oil on the back of the plate or the wooden tool used for making these bananas. Place one piece of banana on the board and place the plate on top, using your weight to squash down and flatten the banana. Repeat until you have finished. Put each banana back into the oil and fry until golden brown, remove it from the oil and place on paper towels, sprinkle with salt and pepper and enjoy! Yummy! I’ve had fried plantains from Cubans, Dominicans, puerto ricans, but nothing like a bannan peze with a creole flavor.